The optimistic annual projection was AUD 2 million. We exceeded this, reaching AUD 2.064 million at the end of this month. I'll do an annual report soon. 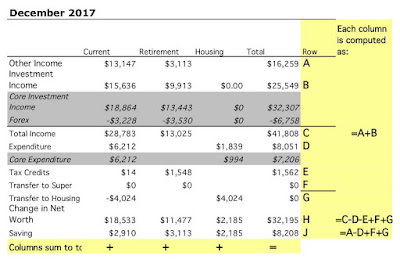 "Current other income" consisted entirely of salaries (after tax) this month and was $13.1k. Spending (not counting our mortgage) was moderat at $6.2k. After deducting the mortgage payment of $4.0k (which includes implicit interest saving due to our offset account - the actual mortgage payment was about $994 less than this), we saved $2.9k on the current account and added $2.2k in housing equity. 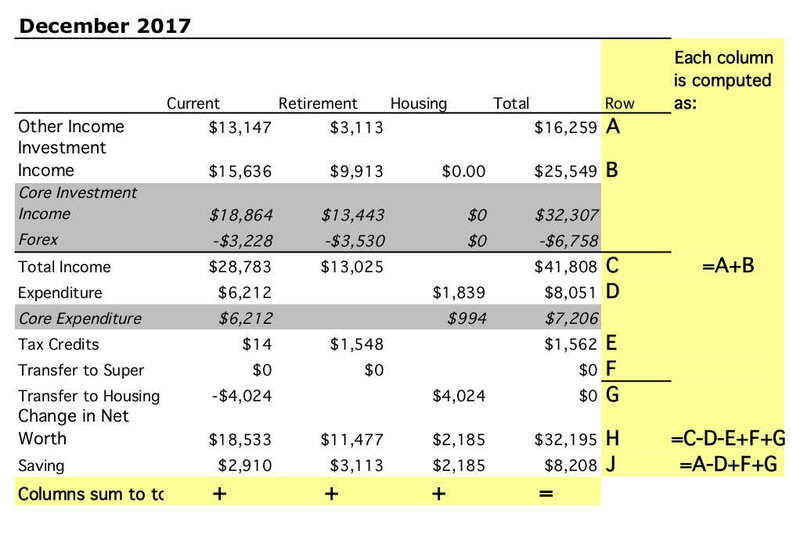 Retirement contributions were $3.1k. Net saving was, therefore, $8.2k across the board. The Australian Dollar rose from USD 0.7571 to USD 0.7813. The ASX 200 gained 1.81%, the MSCI World Index gained 1.65%, and the S&P 500 1.11%. All these are total returns including dividends. We gained 1.43% in Australian Dollar terms and 4.67% in US Dollar terms. So, we slightly underperformed the Australian market and strongly outperformed international markets because of the rise in the Australian Dollar against the US Dollar. The best performer in dollar terms was the Colonial First State Geared Share Fund, gaining $9.2k followed by Colonial First State Developing Companies, which gained $4.5k. Generation Global Share FUnd was the worst performer losing $0.3k because of the fall in the US Dollar against the Australian Dollar. Australian Small Cap stocks was the best performing asset class in percentage terms, gaining 3.54% followed by Commodities at 2.89%. Private equity was the worst performing asset class, but it still gained 0.45%. As a result of all this, net worth rose AUD 32k to $2.064 million or rose USD 74k to USD 1.613 million.